Scroll down to the Fundraiser and Events section and check out Amy Campbell’s latest raffle challenge. Donate only $20 for a chance to win an original Sweet Briar Dairy cow tag. The news section today includes highlights from the last Board meeting, which you might find interesting. And of course right at the beginning is a link to an important message from Sarah Clement, Chair of Saving Sweet Briar, Inc.
of Saving Sweet Briar Inc. 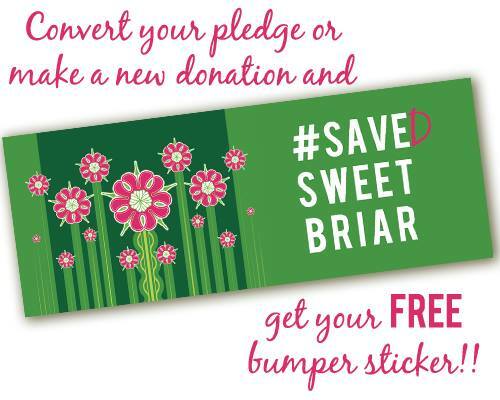 SAVING SWEET BRIAR, INC. IS ASKING YOU TO PLEASE FULFILL YOUR PLEDGES AND MAKE YOUR DONATIONS AS SOON AS POSSIBLE! WE STILL need TO RAISE $1.2 MILLION BY SEPTEMBER 2. And please make checks out to Saving Sweet Briar. PLEASE NOTE THAT ALL DONATIONS ARE WELCOME EVEN IF THEY HAVE NOT BEEN PLEDGED BEFORE. WHETHER YOU HAVE PLEDGED OR NOT PLEASE SEND US YOUR DONATIONS. Help us reach our FINAL settlement milestone by fulfilling your pledge and donating today. Thank you for your continued support of our goal to not only save Sweet Briar but ensure a continued legacy of incredible women graduates. Here’s a great example for more encouragement to help fulfill your pledge – this young, studious, future Sweet Briar Vixen, and future entrepreneur is going to donate 100% of her proceeds from the lemonade stand. If she can do it, so can you. Holla! Holla! August 25th was given as the closing day, but instead it is the beginning of a new academic year! Vixens, we have one more deadline before we can put this whole ordeal behind us. It is Cow Money time! Donate $25 in honor of this day! The Sweet Briar community should note that Sunday, August 23, 2015 is the 150th anniversary of the marriage of Indiana Fletcher and James Henry Williams. Look at the lower left corner of the photo. At the direction of the board chair, Teresa Pike Tomlinson, the board conducted the first paperless board meeting in the history of the college. Through the good work of Dawn Gatewood and Aaron Mahler, directors were able to access even lengthy documents during and prior to the meeting. Except one person, who was held up unexpectedly for business reasons, all directors attended the entire retreat. The Board acknowledged with regret the resignation of Jim Fabiani for health reasons and elected Allison Stemmons Simon ’63 as a new member of the board. Dr. Belle Wheelan, President of the Commission on Colleges of SACS, presented a seminar for the board on the Commission’s accreditation requirements and provided helpful advice on the respective roles of the board and the administration in governance. President Stone presented his State of the College Report. The board received reports from members of the President’s Council and engaged in extended conversations about finances, fundraising and enrollment. The College’s new auditors, BDO, presented an outline of the annual auditing process now underway. The College’s investment counselors, Prime Buchholz, presented a report on the performance of the investments of the college. Ruth McCambridge, Editor in Chief of the Nonprofit Quarterly made a presentation on current trends in nonprofits, particularly on matters of governance. The board met over breakfast with the Faculty Executive Committee for a discussion on governance, open communications and other matters. The board was treated to the first meals served by Sweet Briar Dining Services under new management by Parkhurst. Everyone agreed enthusiastically: thumbs up! At the end of the meeting, members of the campus community, friends of the college,members of the governing boards of the Town of Amherst and Amherst County and other special guests joined the board for lunch on the Upper Quad on a glorious, sunny day. I am excited to announce that tomorrow La Caretta on Rt. 29 in Madison Heights will be presenting SSB with a check for $1,400! They have dedicated the first Tuesday of every month as a “Sweet Tuesday” and will be donating 20% of their profits from these days to SSB! Come out tomorrow night and celebrate the beginning of the school year and the donated funds, beginning at 6 pm. Are you celebrating Women’s Equality Day in Plymouth tomorrow? Please help us get Seth Meyers to come to Sweet Briar and teach for a day. LET’S DO THIS BECAUSE WE CAN!!! The August 2015 Alumnae Alliance Newsletter was emailed out today!!! If you did not get the email, please contact DJ Stanhope at djstanhope@sbc.edu with your correct or preferred email address! Great t-shirts with a lot of fun SBC related designs. 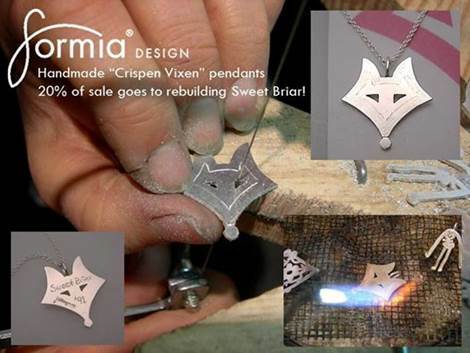 A portion of the proceeds will go to Sweet Briar. I, myself, have bought a bunch of Saving Sweet Briar and Sweet Briar t-shirts. The quality is great, the shirts are super soft. 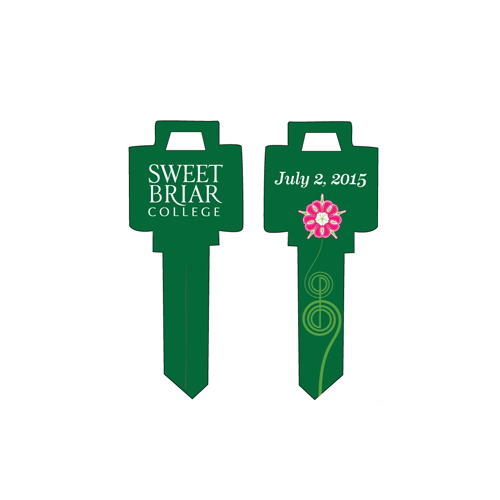 Do you still have five bucks left over after fulfilling your pledge to Sweet Briar? Fund one of the last few keys given to all faculty and staff next week! A HUGE HOLLA TO THE LADIES LISTED BELOW!! THANKS TO YOU, THE SOCCER TEAM WILL HAVE GAME DAY UNIFORMS!! Please follow the directions given here to honor your pledge and PLEASE mail the cheques by Saturday, the 22nd. This will allow uniforms to be ordered next week. Teresa has to funnel all the monies through the proper channels for the donations to be tax deductible for you and also be guaranteed to go to the soccer team for uniforms. EVERYONE ELSE: PLEASE DONATE TO SSB!! WE HAVE A LOT OF MOOOLA TO RAISE THIS WEEK, BUT THERE IS NOTHING A VIXEN CAN NOT DO!! Please vote for Lisa Aumiller a Sweet Briar alumna. Lisa has the chance of becoming THE BEST VETERINARIAN and we all can help her. You just have to vote once every day to help her. Intrigued? Here is the scoop! Thanks Ladies! Please vote daily until September 1st and Please Share! I was lucky enough to be nominated as 1 of the 20 vets for America’s Favorite Veterinarian by the American Veterinary Medical Foundation. This is the charitable arm of the AVMA. I am the only NJ vet, one of two mobile vets AND the ONLY Sweet Briar graduate (Holla Holla) . This would be great recognition for HousePaws Mobile Veterinary Service and all we do for the community. If I win I get to be the national spokesperson for the AVMF for one year AND I get bragging rights. This would be so huge if a mobile vet one! Please vote and share! !